A great beginner sweater project, this cardigan uses worsted-weight yarn, has a top-down raglan construction and is completely seamless. The only finishing you’ll have to do is picking up stitches for the button bands. 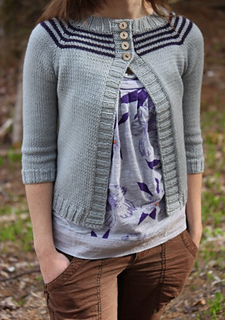 It is inspired by my toddler/child cardigan “Wonder Years”--I thought it would also make a cute woman’s cardigan too! Shaped ¾-length sleeves and a slightly cropped length make this a great spring/summer garment—perfect to wear with a cami, tank, or light t-shirt underneath. All measurements in this pattern are provided in both inches and cm. Below are some more details about Crocus. If you have additional questions you’d like answered before purchasing the pattern please feel free to send me a message.